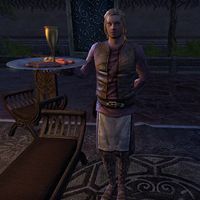 Fabremund Ragon is a Breton servant who can be found in the Saint Olms Waistworks in Vivec City. He stands in the center of the plaza and holds a large platter of food and drink. He may be serving Alberic Drenim, a noble who sits nearby. Fabremund has no unique dialogue. This page was last modified on 8 July 2018, at 08:07.